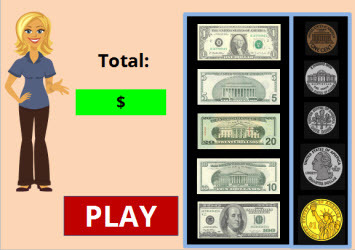 This free money game is an exciting way to learn basic facts about money. The game has 10 simple problems. Click on the coins and bills in this cash register to answer each question. Game Directions: Click on the coins and bills in the cash drawer to show the correct answer. Some answers can have multiple correct answers. For instance, $1.50 might be one 1 dollar bill and 2 quarters, or it could be 6 quarters, or even fifteen dimes. If you make a mistake, click on the reset button to put the money back in the register and start over again. For each correct answer, you will earn a point. This game can be played on computers, iPads, and other tablets. You do not need to install an app to play this game on the iPad. Return from this free money game to play other educational money games.